Wednesday June 29th 1892 I did most of the ironing this morning while Sadie went to town. We worked on the quilt what spare time we had. The girls were over in the afternoon and we got it done so they took it home with them. weather quite cool. Thursday June 30th 1892 I put in a quilt for myself in the morning and we got some done on it before noon. In the afternoon Mother and I drove old Pet out to the west farm and then over to town. We just enjoyed it. We got supper over and the evening work done then went early to bed. Mother is better. Friday July 1st 1892 We had baking and extra work to do and did not quilt much in the forenoon. the girls were over in the afternoon and we got a good deal done. We were working about the yard some before supper. I wrote some in the evening. Saturday July 2nd 1892 We worked nearly all day at the quilt, finishing it before supper. The girls were not over. There was a terrible rain storm about the middle of the afternoon. It blowed down part of our cattle shed. Sunday July 3rd 1892 I was busy about the work all forenoon. Will and I spent the afternoon over at Marys. When we came back found the folks here from town and Willie Bremmer was with them. Willie stayed till after supper. 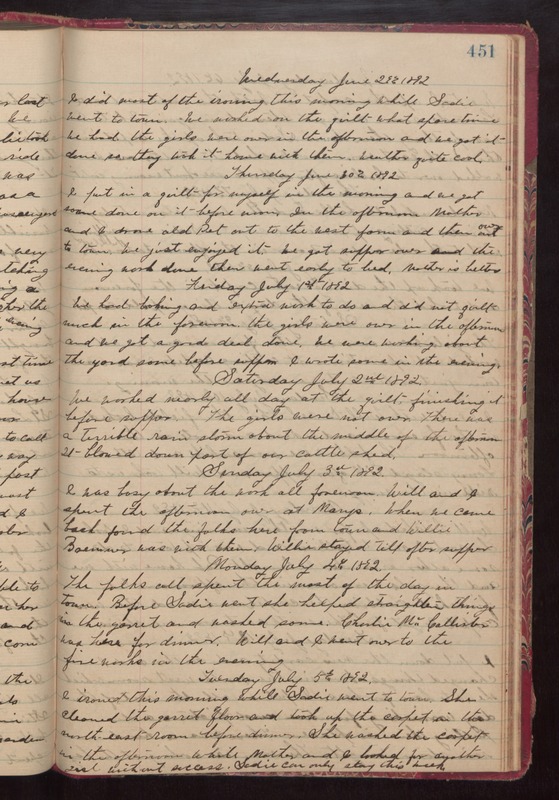 Monday July 4th 1892 The folks all spent the most of the day in town. Before Sadie went she helped straighten things in the garret and washed some. Charlie McCallister was here for dinner. Will and I went over to the fire works in the evening. Tuesday July 5th 1892 I ironed this morning while Sadie went to town. She cleaned the garret floor and took up the carpet in the north east room before dinner. She washed the carpet in the afternoon while Mother and I looked for another girl without success. Sadie can only stay this week.